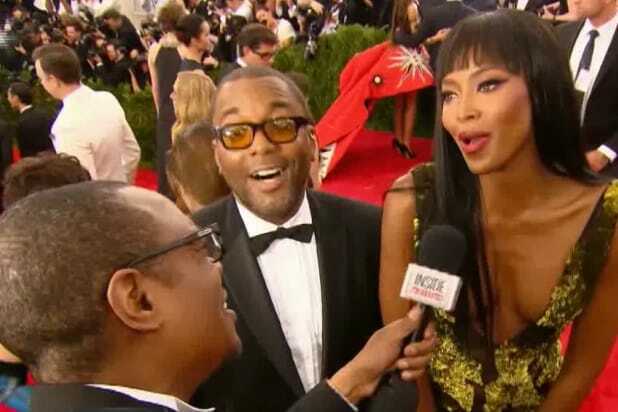 Naomi Campbell will guest star again in Fox’s “Empire” next season, show creator Lee Daniels said on Monday. The two arrived together at the evening’s Costume Institute at the Metropolitan Museum of Art gala, where they were promptly bombarded with questions about the smash hit soap opera, on which Campbell plays Camilla Marks, the “cougar” dating Hakeem, the youngest talent of Lucious Lyon’s brood. When “Inside Edition” asked the former supermodel if she would return for Season 2, she deflected the question to date Daniels: “I don’t know, Lee are you bringing me back?” she asked, apparently in earnest. Campbell swore that she didn’t know. Even if she was faking ignorance, that’s the kind of solid acting we’ll see next fall on Fox. Neither Fox network nor the TV studio immediately replied to TheWrap‘s request for comment on the red carpet revelation. Anne Hathaway is bold in gold. Lizzie Caplan dazzles in a champagne number. Rihanna's bright yellow Guo Pei haute couture gown required four people to help get the heavy train up the stairs. Vogue editor and party chair Anna Wintour poses with daughter Bee Shaffer at the start of this year's gala, "China: Through the Looking Glass." Newlyweds George and Amal Clooney make a stunning pair on the Met Gala carpet. Sarah Jessica Parker is always a risk-taker at the annual style parade. Katie Holmes debuted a new bob haircut. "Being Mary Jane" star Gabrielle Union looked plum in earth tones. Kerry Washington lumbers into the museum with her massive pink confection. If fashionistas Mary Kate and Ashley Olsen are headed to Netflix's "Full House" reunion, we hope it has ample closet space.